I was walking on E street yesterday, and I noticed that my most favorite store was now a hollowed-out shell. 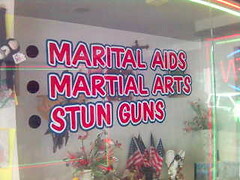 No longer can you get Marital Aids, Martial Arts Equipment and Stun Guns in the same place. Sigh, whatever shall we do?! That actually sounds like the perfect amalgamation of services to solve all of life’s problems, marital or otherwise. Think of all the dual-use natures for these product ranges! They were huge space-savers.